QardioArm Wireless Blood Pressure Monitor is a unique and stylish blood pressure monitor that is clinically validated to measure your systolic and diastolic blood pressure and heart rate with medical-grade accuracy. The device also features irregular heart beat detection. QardioArm is a blood pressure monitor that doesn’t look like a medical device. 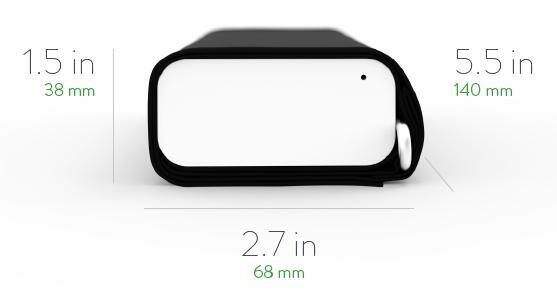 It is light, portable, compact, and discrete. In fact, it’s rather Apple-like in design and that extends to the classy packaging. You can actually put it in your suit pocket – just like the advertisement depicts. The makers made the cuff with simple in mind. It has a cuff and that’s it. No power button, no display. To use this cuff, you absolutely must have a smartphone. Weight: 310g (0.68 lb) including batteries. Cuff Size: 22-37cm (8.7-14.6 in). Suitable for sizes S, M, and L.
Unlike traditional blood pressure monitors this device is cleverly designed with an integrated cuff serving as a protective cover. The Qardio app is free and available on the App Store and Google Play. The app is easy to use, a large start button pops up when the app pairs via Bluetooth and detects the band. Blood pressure readings are displayed as a list or in an easy-to-understand chart, and visualised on the World Health Organisation scale. This allows you to get a quick visual reference of where your blood pressure is and where it should be. All your blood pressure measurements are automatically saved in Qardio’s secure cloud, from which you can choose to share them with those closest to you or your doctor. Measures your systolic, diastolic blood pressure as well as heart rate, includes irregular heart beat detection. Tracks your measurements over time with smart charts, trends and stats. Fully integrates with the Qardio product family using the companion Qardio App which automatically stores all your data in Qardio’s sercure cloud. Allows you to share your measurements and progress automatically with your doctor and family. Works with Apple Health and integrates with Apple HealthKit. You can easily perform a triple measurement average for the most precise feedback. QardioArm also offers a number of unique features such as ‘places’, allowing you to monitor your blood pressure across multiple locations to help you understand how your lifestyle impacts your health. The ‘friends and family’ function lets you follow others or allows others to follow you back, creating a support network for better health outcomes. The Quardio app stores all your readings, helps you set measurement reminders and encourages you to keep your blood pressure in check with activity view. With Qardio App’s ‘places’ you can see how your blood pressure changes around your life – at home, the office, or when traveling. You can set reminders, notifications or track your monthly averages to stay on top of your health. With these insights you can adjust your lifestyle towards better health. QardioArm is the wireless blood pressure monitor that fits into your daily life with its revolutionary design and effortless user experience. The device makes it simple and convenient to have your smart blood pressure monitor with you at all times. The blood pressure monitor automatically connects to your mobile phone for a simple and effortless measurement. It is very small, lightweight and easy to pack. QuardioArm was the first medical device to support Apple Health and now works with Apple Watch. It is available in a range of attractive colours. Overall, it is a excellent choice that offers good value for money.